In an anxious final day France’s Axel Mazella sealed victory at the International Kiteboarding Association (IKA) KiteFoil GoldCup in eastern China with a pair of assured bullets. But heading out on to the water with his 21m kite in the light airs that had taken most of the day to fill, overnight leader Mazella was aware that Britain’s Guy Bridge just behind in second place overall was breathing down his neck and the slightest mistake could cost him the event. 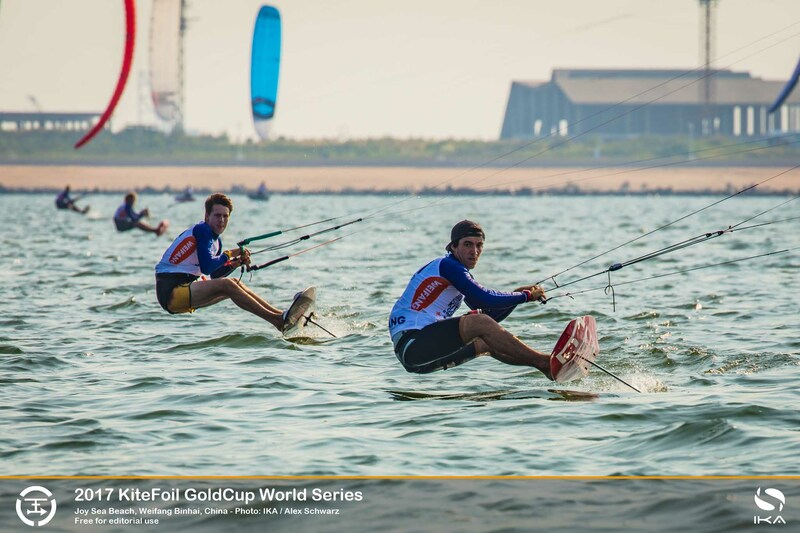 In the end the Team Enata foils and kites’ poster boy held the lead almost from the start of the first race. He finished well ahead in the 7kts to 8kts of breeze on two laps of the windward-leeward track on the Yellow Sea’s smooth waters. 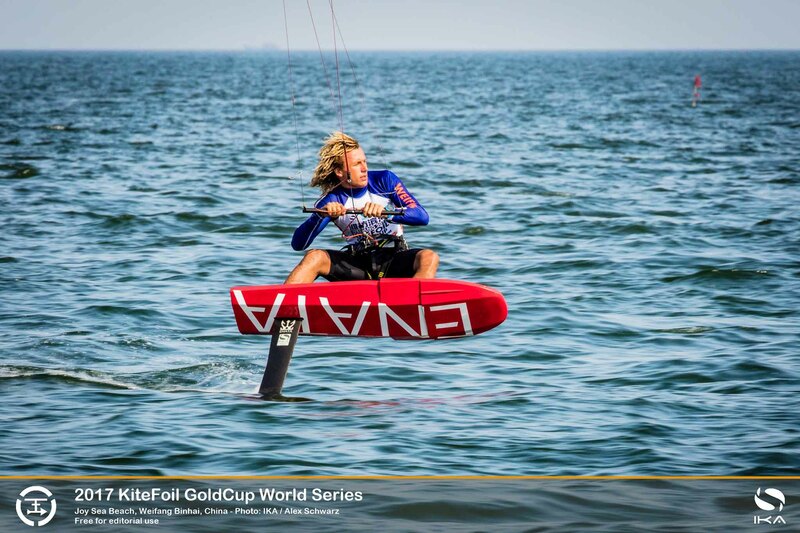 In the light airs Bridge, on his 21m Flysurfer Sonic Race kite and Levitaz Bionic foil, could only manage third behind his other key rival, Enata’s Theo Lhostis (FRA). But in the day’s second race as the breeze freshened to 9kts Bridge was hot on Mazella’s heels all the way around the course, with only a few seconds separating them at the end. The contest among the women, racing in the mixed fleet, was similarly tight. But even with former Formula Kite World Champion Elena Kalinina (RUS) and France’s Alexia Fancelli locked together on points at the start of the day, the Russian edged it when she twice crossed the line just ahead of her rival, with the fast-improving Anaïs Mai Desjardins (FRA) close behind taking the third podium spot. 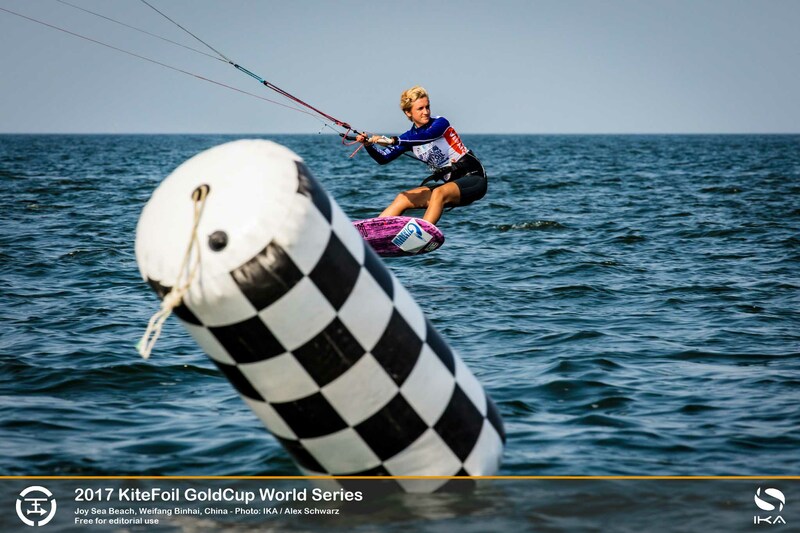 The fifth and final day of the IKA KiteFoil GoldCup was marked by the light breezes that characterised the event which, with €50,000 in prize money up for grabs is the richest of the four-stop tour that travels south to China’s windy Pingtan Island next week. The tour will wrap up next month at the IKA KiteFoil GoldCup finale in Italy at the Sardinia Kiteboard Grand Slam on Cagliari’s Poetto Beach, with the event winner crowned the IKA KiteFoil World Champion, while the KiteFoil GoldCup trophy will go to the best rider of the tour. Despite Mazella’s win in Weifang, Guy Bridge, 18, could stake a claim to being the most exciting rider. On day three of the five-day regatta, Bridge racked up an amazing four bullets from six races and was a whisker from taking a fifth in the stiffer breezes that hit 12kts to 14kts. For the younger brother of seasoned racer Olly Bridge (GBR), it was a stellar performance and marked his breakthrough on a day when he lived up to the promise he had hinted at for some time, always showing great pace but lacking consistency. After grabbing the overall lead with his audacious performance, his disappointment was palpable when he surrendered the top spot to Mazella on day four after he struck something in the water and was thrown from his foil, struggling to get going again in the ultra-light breeze. But even as he battled to close the two-point gap to Mazella in the final day’s two races, he knew it would be tall order to overhaul his French rival in the lighter breezes that favour his physique and Enata foil and kite set-up. Bridge was pushed all the way by Lhostis, also 18, who took the third podium spot, and was delighted with his showing that similarly signalled his best run at a big event. For Elena Kalinina the worry was where was Alexia Fancelli? The Russian found herself stretched as they almost matched raced one another around the track in both races. The fleet is now heading to Pingtan Island for the second part of the Chinese back-to-back regattas starting on September 18, 2018.